First, you will choose the character of the 3 races that are available - Elf, Human, or Barbarian (race as a mainstream RPG) to start the adventure in the Birth City. Indeed, growth in terms of how characters are not too many changes ranging from beginner level to the end, but this game offers a variety of complex scenarios with spices intrigues which are intertwined, so it fills the main elements of RPG, which is addictive! Live quests, creatures and mnster hunt for leveling up together to form guilds. Graphically eDragon also fairly reasonable. Display environment such as building the Palace, residence, warehouse, Arena, Blacksmith, Weapons & Armors, Store and Tavern tilled in detail (and realistic color composition course).Interface to the game simple and easy to use (quite good for the size of web-based). 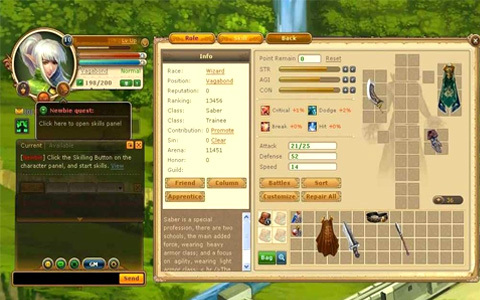 Player by simply dragging items to the drop of available extra bag in the bottom panel, and equipment are distinguished according to levels based on colors: White (basic equipment), Green (attribute bonus), Blue (bonus items) Purple (extra items), and Red ( unique gear). To complete the equipment, the player can go to the Greedy Shop. We can also follow the gambling mini-games to get certain items, but risk being kicked out of the store .. ^ _ ^. Battle FeaturesPlayer can undergo in pvp duel in the arena, which could be an alternative to improve the status in addition to completing a quest-a quest that exist.It is a bit disturbing that the fighting is done by turn-based system. To Each battle will take time 8-10 minutes. Quite long too, so suitable for those who have plenty of spare time to undergo a duel every 10 minutes. Posted by Game4share at 9:56 AM . Filed under .